Fresh off the heels of last weekend's San Andreas Anniversary celebration in GTA Online, we've got three more days of in-game bonuses and more to take advantage of this Halloween weekend starting today Friday, October 31st. In ghoulish fashion, all Deathmatches will reward players with Double RP and Double GTA$ all weekend long – including Rockstar Created, Rockstar Verified and all player-created Deathmatch Jobs. The inhabitants of Los Santos will also be out causing mischief in Freemode and gathering treats along the way from Crate Drops including Firework Launchers, exclusive T-shirts and more. We've also got the #TrickOrTreat Snapmatic contest in effect so go all out on your weekend costumes with half price discounts on Masks and select Hats, as well as 50% off orange tints and smoke trails to aid you in capturing the Halloween spirit. Read on for full details. Frightful GTA Online encounters are guaranteed with Double RP and Double GTA$ in all Deathmatches, all weekend long. Aim for the pumpkin to max out the headshot RP bonus, or seek out a dark corner of the map to plot your ghoulish intentions. 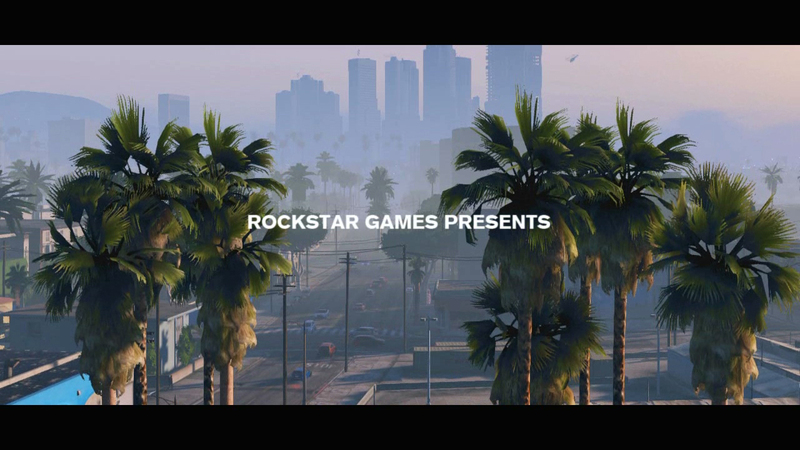 There'll also be Firework Launchers, Miniguns and an abundant cache of RP, GTA$ and ammo. We've upped the frequency of the Special Crate Drops in every Freemode session - keep an eye on your Feed ticker to find out when they're coming down and look for the Smugglers plane on the map so that you can track the landing spot of the Crate itself, but be warned: You are not alone. To get you into further frightful festivities, you'll also need a costume worthy of playing the part. Vespucci Beach Mask Shop offers an array of accessories and freaky faces to complete your outlandish outfit. This weekend, you'll be able to purchase all masks and hats at half-price and we've also discounted orange weapon tints, orange parachute smoke and orange tire smoke. Finally, in case anyone tries to steal your ride, grab a half-price ignition bomb for a special Halloween trick. All Hallows Eve can play tricks on the mind - fool your enemies into doubting their senses with 75% off Lester's Off the Radar service. Go ghost, and use it to get the jump on any goblins looking to ruin your day. Once you're fully decked out in your most creative outfit, hit the sidewalks and alleyways to put on a full-on freakshow. Capture your best Halloween-themed shot with Snapmatic, tag it with #TrickOrTreat on Social Club and you could have your pic featured at the Rockstar Newswire, not to mention a treat of GTA$1M. Official Rules here. Tune in as we'll be playing through a selection of player-created horror themed Jobs and more during a special Halloween Edition Livestream this Friday October 31st at 4pm ET / 8pm GMT. We'll be joined by special guests from the community as we stalk, slash and body one another in Deathmatches, check out each other’s best Halloween costumes and more. We’ll be inviting a few guest players to join the lobby via both Twitter and during the stream via Twitch chat – so make sure you’re Following us in both places to get the word. Sounds like a ghoulish good time! Join in in the Forums, if you dare... MWAHAHAHA! 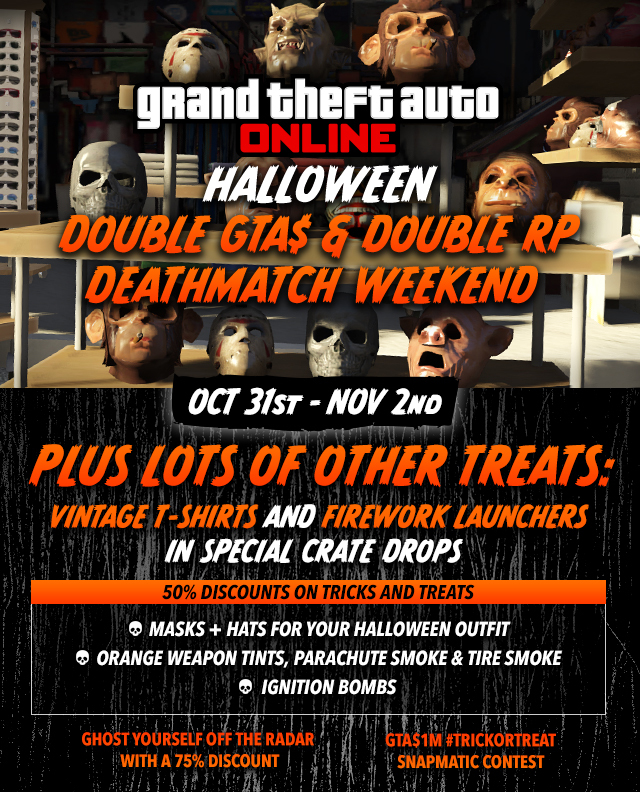 Halloween Weekend Event - 2xRP/GTA$ this Halloween Weekend on All Deathmatches, plus Snapmatic Contest, Special Crate Drops, and More!